I had the distinct pleasure of interviewing Derek Rydall the author of a new book entitled ” Emergence: Steven Steps for Radical Life Change. In my interview with Derek we discussed his unique approach to the end of self-improvement. As Derek discussed with me, his premise is that if we look at ourselves as being whole and complete just the way we are, we don’t need to change anything. I actually really like his approach, because it is correct. Each and every soul that is incarnate on this planet is whole and complete, and if we were to approach life from this perspective we would not come from lack, limitation and fear. Our ego does a really good job of instilling within us the feelings of lack, limitation and negative self talk. Derek uses the symbolism of the “oak tree and the acorn” and calls it the acorn principle. Because many of us hold a belief that our fate is determined by external conditions and that things we need are “out there”–the reverse of how life really works-we constantly struggle against the nature order of the universe. The acorn principle allows you to understand your true nature, and how you were designed to grow and thrive. The acorn already contains the perfect pattern and potential to become an oak, and so do you. 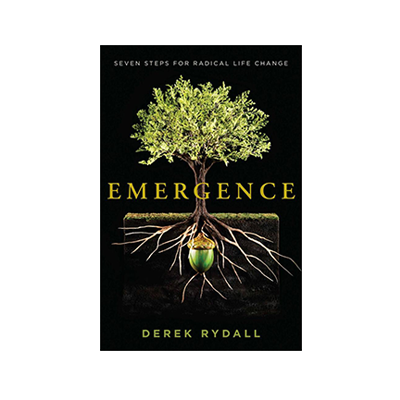 If you want to learn more about Derek and his new book Emergence: Seven Steps for Radical Life Change please click here to be directed to his website. I hope you enjoy my interview with an author that takes a totally radical perspective to ending our delusion of lack and limitation, and truly helps us see who we really are and capable of growing into.